Hubbell’s PowerHUBB™ is an enterprise-level, Power over Ethernet (PoE), lighting and control platform that seamlessly integrates luminaires, sensors, user interfaces and software for a scalable, intelligent building control solution. Hubbell Control Solutions' PowerHUBB platform delivers intelligent sensors, intuitive user interfaces and scalable PoE technology that enables a highly configurable, enterprise software solution with cloud analytics. Hubbell Lighting's portfolio of PowerHUBB enabled luminaires deliver quality illumination while reducing energy consumption, and total cost of ownership for PoE installations. Hubbell Premise Wiring manufactures a fully integrated system of copper and fiber network cabling, and components that are designed to meet PoE performance and reliability standards. 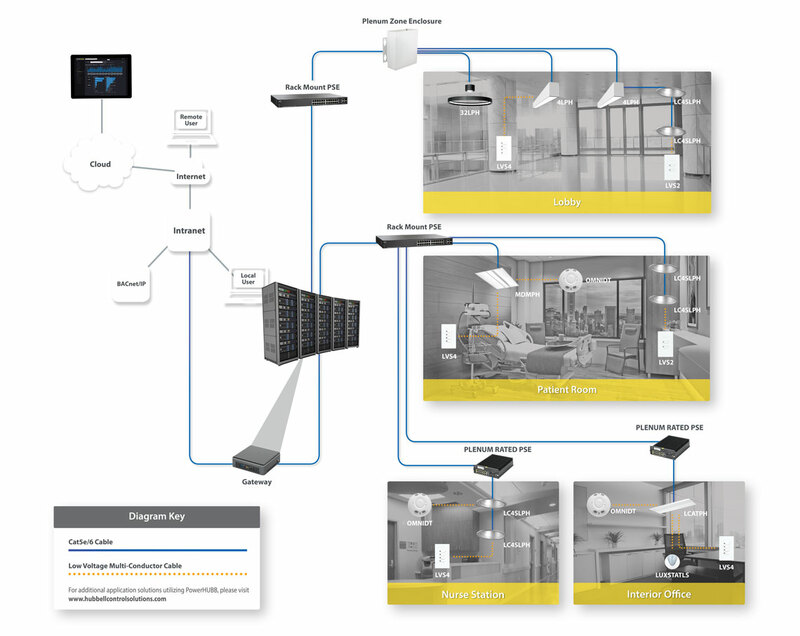 Hubbell Control Solutions’ PowerHUBB™ platform provides building owners and lighting practitioners with a fully integrated, end-to-end, intelligent PoE network leveraging the Internet of Things (IoT) to future-proof buildings through a highly scalable, digital ceiling platform. PowerHUBB's enterprise technology provides a clear path for cost-effective smart building deployments, delivering the best ROI in the industry. PowerHUBB software can scale from basic lighting control to advanced cloud based analytics. The analytics provide building automation integration and IoT application development to deliver smart building solutions that help improve decision making, and the bottom line. PowerHUBB delivers a system designed to meet the latest requirements of ASHRAE, IECC and Title 24 energy codes. Utilizing its robust software tools and embedded device intelligence, PowerHUBB provides a simple and customizable means to meet project requirements while delivering additional energy savings. A Power over Ethernet installation reduces material and labor cost by using a single Cat5e/6 connection for power and communication. This plug-and-play, low-voltage cabling approach greatly simplifies the installation process, saving time, minimizing safety risk and helps to alleviate resourcing constraints for skilled labor. Greater energy savings can be realized by implementing PowerHUBB's advanced energy management tools, automation access and open Application Programming Interface (API) to drive scalable and aggressive control strategies across the building environment. Further reduction in energy consumption can be gained by using dashboards to visualize trends and measurements for optimizations and improved efficiencies. PowerHUBB's scalable software suite provides configurable options for delivering advanced customized energy saving strategies, building automation integration, and enablement of IoT solutions. From simple lighting control to advanced cloud based energy management analytics, PowerHUBB empowers your lighting to deliver value beyond illumination with a data driven, open platform. PowerHUBB™ provides a seamless, code compliant, lighting power and control, intelligent building solution utilizing Power over Ethernet technology. The platform utilizes standard Ethernet Cat5e/6 cabling to distribute power and control, as well as provide monitoring capabilities over a PoE network - no line voltage wiring required. PowerHUBB technology is available in a variety of high-performance Hubbell LED luminaires and is supported by a wide range of Hubbell control and datacom devices. An ever-growing portfolio of PowerHUBB enabled indoor and outdoor luminaires provides you the breadth and flexibility to address all your project requirements today and in the future.